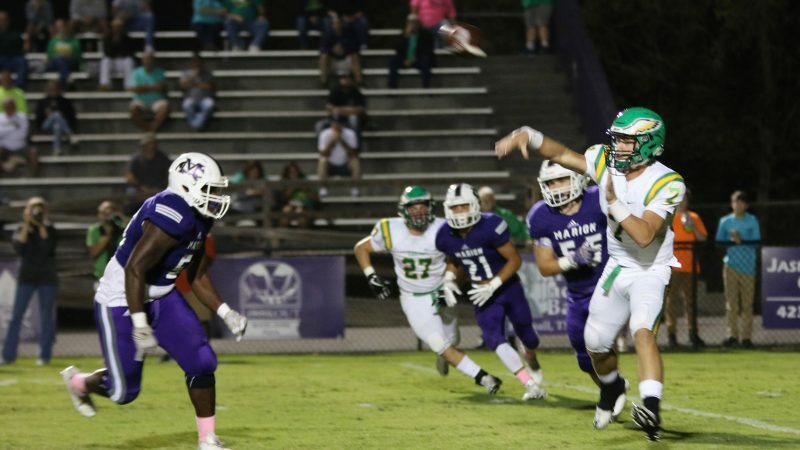 After having been on the road the previous two weeks and after coming up short of a win in each contest, the Eagles got on the right track in Jasper on Friday night, downing the Warriors of Marion County by a final score of 34-10. The Warriors gave the Eagles a bit of a scare in the first minutes of the game, stuffing the Power-T offense while on defense and driving deep into Rhea County territory on the ensuing drive. The Eagle defense held their ground, however, and forced a field goal. Marion County capitalized on the chance and took a 3-0 lead over their 5A opponent in the first quarter. Rhea County would go on to score 21 unanswered points, making the halftime score 21-3 in favor of the visitors. The Eagles would close out the night by only allowing the Warriors one more score while scoring two more touchdowns of their own. In his first night handling place-kicking duties, junior Brady Rice was 4-5 on PAT attempts. The Eagles were led on the ground by stellar performances from senior fullback Brandon Hunt (1 TD), senior wing Christian Simon (2 TD), and senior wing A.J. Velasco (2 TD). Rhea County now moves to 4-4 on the season with a monumental matchup against Soddy-Daisy this Friday at Bill Horton Field.